Technological growth is the result of new inventions and innovations. Every invention is something new and in most cases it is a combination of already existing technological elements. An invention becomes innovation when applied for the first time. An innovation which has little disruptive impact on behaviour pattern is called a continuous innovation (e.g. fluoride tooth paste). In such cases alteration of an existing product rather than creation of a new product is involved. There are also dynamically continuous innovations which do not involve new consumption patterns but involve the creation of a new product or the alteration of the existing one (e.g. electrical tooth brush). Further, there are discontinuous innovations, which involve the establishment of new behaviour patterns and the creation of previously unknown products such as automobiles, televisions, computers etc. The process of technological change is clearly linked to innovation. Technological change occurs through substitution and diffusion. The simplest form of technological substitution occurs when a new technology captures over a period of time a substantial share of the market from an existing older technology. The new technology is better and economically more viable. Thus after it has gained small market share, it is likely to become more 'competitive with time. Therefore, once a substitution has begun, it is highly profitable to eventually take over the available market. This is a simple one-to-one technological substitution process. There is a broad spectrum of factors, which can have an impact on the process of substitution and diffusion. These can be broadly classified into (a) factors affecting the demand for a technology; and (b) factors affecting the supply of a technology. The life span of various technologies can be conveniently identified as consisting of four distinct stages, all of which taken together form the ’Technology Life Cycle'. The stages of technology life cycle are innovation, syndication, diffusion, and substitution. Innovation stage: This stage represents the birth of a new product, material or process resulting from R&D activities. In R&D laboratories, new ideas are generated by ’need pull' and 'knowledge push' factors. Depending upon the resource allocation and also the change element, the time taken in the innovation stage as well as in the subsequent stages varies widely. Syndication stage: This stage represents the demonstration (pilot production) and commercialization of a new technology (product, material or process) with potential for immediate utilisation. Many innovations are shelved in R&D laboratories. Only a very small percentage of these are commercialized. Commercialization of research outcomes depends on technical as well as non-technical (mostly economic) factors. Diffusion stage: This represents the market penetration of a new technology through acceptance of the innovation by potential users of the technology. But supply and demand side factors jointly influence the rate of diffusion. Substitution stage: This last stage represents the decline in the use and eventual extension of a technology due to replacement by another technology. Many technical and non-technical factors influence the rate of substitution. The time taken in the substitution stage depends on the market dynamics. There is another way of looking at the technology life from the perspective of growth and diffusion. Every technology eventually reaches a decline phase owing to the development of better technologies (in terms of performance and/or cost). In other words technological change occurs through 'substitution'. The process of technological advancement through substitution is shown schematically in Fig-1. Most technologies follow an S-shaped growth pattern. However, it has also been observed that, although 'Particular technology eventually reaches a stage where it has limited use, new technologies are developed to achieve further growth with respect to any particular ‘figure of merit' (i.e. index of particular requirement). For example, if one takes the speed of passenger travel as a `figure of merit', then Technology T1 is a propeller aircraft, T2 is the turbo prop aircraft and T3 is the jet aircraft. Each of these, technologies normally shows an S-shaped improvement over time. 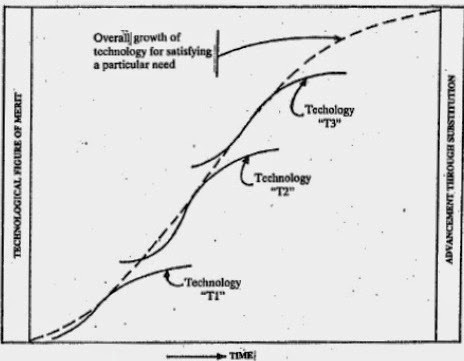 Moreover, the overall growth of these successive technologies (representing a system of high order, characterised by a succession of discontinuous innovations) also exhibits an S-shaped growth pattern. Source: Technology for Development, UN-ESCAP,1948. The hardware intensive technology diffusion process can be considered to consist of five phases (Figure 2). The first is the 'incubation phase' where many ideas are gradually reduced to one commercial product for introduction into the market. Next, is the 'introduction phase' where the applications of the new technology are very slow. Later when the number of applications increase rapidly, the technology is in its "growth phase". After sometime its growth reduces and some stability can be observed in the ‘maturity phase'. Finally, an improved substitution makes the technology obsolete, and hence it enters the ‘decline phase'. It may be noted however, that time taken for these different patterns varies widely. The introduction, growth and maturity phases of a technology are also referred to as the three major stages of ‘Technology Life Cycle’. It is recognised that it is neither possible nor desirable to try to develop technology in every sector when one talks of building up indigenous technology. Nevertheless, it may highly desirable that in carefully selected areas of production there is a vertical integration with respect to all stages of technological transformation necessary to put a product on the market, starting from the natural resources. 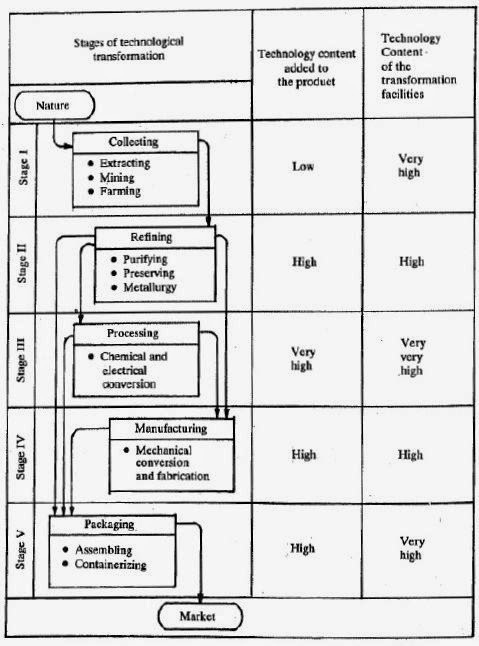 A schematic presentation of the stages of technological transformation in the production of goods is presented in Figure-3. The presentation is simplistic and it only illustrates the basic point of technology planning. Everything starts from nature and eventually goes to the market. In between there are five major stages of transformation. The first stage is called the 'collective stage' and includes such operations as extracting, mining and farming. Stage two can be called 'refining stage' and includes operations such as purification, preservation and metallurgy. ‘Processing' can be deemed as third stage where chemical and electrical conversions take place. The fourth stage is the ‘manufacturing stage’ which refers to all kinds of mechanical conversions and fabrications. The last stage is ‘packaging stage', where things are assembled and packaged for dispatch to the markets. There are considerable variations in the technology content added to the product at each of these five stages.